20th Century Fox's The Predator is shaping up to be one of next year's most anticipated movies, especially after it was confirmed this past summer that The Predator connects to Predator 2, and today we have new plot details. While Shane Black had said from the beginning that this project wasn't a reboot, Jake Busey revealed in June that he is playing the son of Peter Keyes from Predator 2, who was played by the actor's real-life father, Gary Busey. In a new interview, Jake Busey reveals that this movie does fall in line with the previous movies, but it will also reveal that these Predators have a bigger motive than hunting, as to why they come to Earth in the first place. "This one definitely falls in line with the original franchise in that it does focus on the technology that the Predators have. It focuses on what the goal of the Predators is, and what their modus operandi, and why they come to the planet, and that type of thing. It's definitely in line with the original franchise." At the end of October, Thomas Jane offered the first Predator plot details, revealing that the story centers on a group of dazed soldiers who are being transported to a military hospital, one of whom is being targeted by the government because he saw one of the Predator ships land on Earth. Thomas Jane reveals that these soldiers eventually take the bus over and decide to kill these Predators themselves, as these alien creatures show up in a suburban neighborhood, which seems to be the actual setting despite director Shane Black denying these 'rumors' before production even started. Jake Busey also spoke about the memories he had of visiting his father on the futuristic set of Predator 2 as a young boy. "I remember visiting my dad on the set [of Predator 2] and him showing me his suit and his haircut. It definitely looked different than what people were wearing at the time. I remember thinking, 'Wow, yeah. He definitely looks futuristic.'" What's interesting is, we learned last month that Predator 2 was originally set in WWII, so this movie could have had a much different type of story to deal with, but that story was ultimately scrapped for the plot that was set in 1997 Los Angeles. 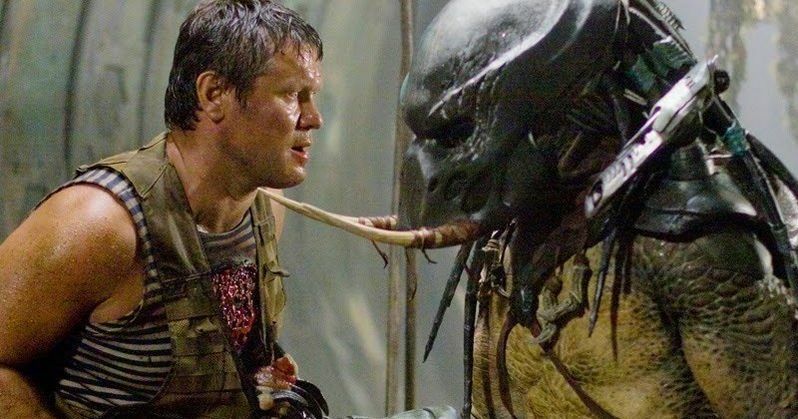 Jake Busey also confirmed that The Predator will be situated between Predator 2 and 2010's Predators, which was set on a completely different world and in an unknown year in the future. When asked about why he was cast, Jake Busey had this to say. "(Director Shane Black) felt that it would be a nice tie-in, and something to add some depth and connectivity between the two films, sort of tying the franchise together in a tighter knot having the characters more closely bound." The Predator wrapped shooting in early June, and we reported last month that the first test screening reactions came in, with some absolutely loving the movie, which is apparently much more comedic than the original movies, and some hating it. It remains to be seen if these reactions will prompt any tweaks and/or reshoots as we get closer to the August 3, 2018 release date. Jake Busey revealed these new tidbits in an interview with Pop Culture earlier this week.